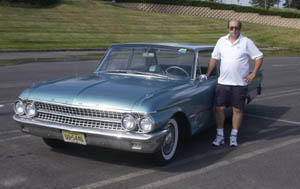 Here is Carl Villone's 1958 Lincoln Continental Mark III. The car has 49,000 miles. 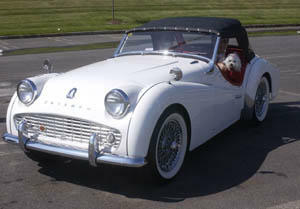 It is a 1 owner car, fully documented, original paint, engine, and interior. Mechanically it has been refreshed with a totally new suspension and brakes, tires, battery, upper and lower hoses, windshield wiper system restored, clock, washer system restored, all new belts, coolant system flushed, transmission system clean and serviced, front end alinement performed. Interior was refreshed with leather treatment of the seats and the carpet total cleaned. The chassis was totally restored for show. The car runs and drives like it should with no hesitation and starts right up with no problem. 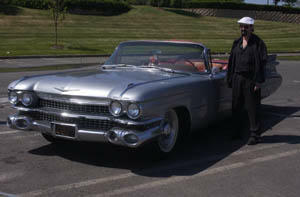 The 1959 Cadillac is known for its gigantic tail fins. This beauty is owned by Larry and Ilene Lesinger. This English import was very popular in the US. This beautifully restored AACA Senior car is owned by Steve and Joanne Posset. The restoration was a labor of love because the car was in the family almost since it's inception.